Blackface isn’t just a southern thing. It’s not an archaic form of racism, either. Blackface still happens today and there’s no excuse for it. On Feb. 1, the far-right blog Big League Politics published photos from Virginia governor Ralph Northam’s 1984 yearbook page. The page shows a photo of a man dressed in blackface and another man dressed as a Ku Klux Klan member. Northam initially apologized and said he was in the photo. But then, he held a Feb. 2 press conference and denied he was in the yearbook photo, but said he had worn blackface in the ‘80s when he did a Michael Jackson impersonation. The nation was collectively baffled. Blackface is unacceptable under all conditions. We’re appalled at Northam’s inability to see the racism he exhibited and at his bumbling way of dealing with this crisis. He made the mess worse by his foolish response and lost his chance to lead. All but one editor thinks he should step down and let his state and the nation heal. Northam was graduating from medical school when he selected the blackface photo as one of four photos for his yearbook page. He was old enough to know better. He was older than we are now. Blackface appears in two other images in that 1984 yearbook. Even if it’s not him in the photo, he put it on his page. He should have known better. We know better and we are undergraduates. America has an ugly history with racist blackface and minstrel acts. It’s taken way too long for white America to accept that dressing in blackface isn’t funny. In the late ‘90s and early ‘00s, late-night hosts Jimmy Kimmel and Jimmy Fallon performed in blackface on national TV. Buffalo is no stranger to blackface. One of the founding minstrel shows in America –– Christy’s Minstrels –– started in Buffalo. We also think it’s important to recognize the medical field is not foreign to racism, as the Tuskegee syphilis experiment affected 600 black men with only 74 test subjects alive at the experiment’s 1972 conclusion. It worries us that Gov. Northam could have had dozens of black patients, all of whom were probably unaware of this photo. As governor, Northam’s policies affect roughly 1.5 million black Virginians. That’s too many people who could feel slighted if Northam fails to step down. Today, we know blackface is wrong. This is universally accepted. Our generation also knows everything we do is recorded. We know there is no “right to be forgotten.” We can’t be young and foolish, as so many of Northam’s peers claimed to be. On Wednesday, Virginia Attorney General Mark Herring admitted he and his friends used blackface to imitate rapper Kurtis Blow in 1980. He apologized for the behavior and what he called “our ignorance and glib attitudes,” which didn’t consider the perspectives of others. “That I have contributed to the pain Virginians have felt this week is the greatest shame I have ever felt,” he said. It’s a lot more honest than Northam’s half apologies. Still, we are uncomfortable with people in power trying to legitimize choices and racist acts or statements they made in the past. We’d like to see politicians and celebrities like Billy Crystal and Robert Downey Jr., who’ve used or joked about blackface, open up about their reasons and the upbringings that led them to think such jokes or actions were funny or inoffensive. We even think "Looney Tunes" cartoons need re-evaluation. We expect more discussion of Northam and the state of Virginia in coming weeks. We see it as a chance for our country and our campus to talk about this important issue. 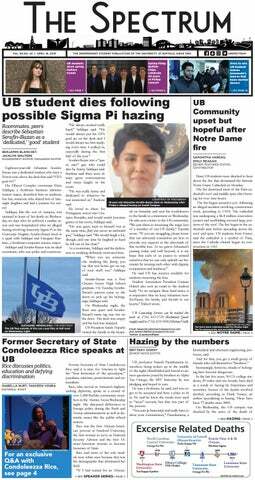 Please write or tweet us your thoughts on Twitter at @UBSpectrum.